SOCHI, October 17. /TASS/. The soonest possible establishment of a constitutional committee in Geneva and restoration of the Syrian economy are among key tasks in Syrian settlement, Russian President Vladimir Putin said after talks with President of Egypt Abdel Fattah al-Sisi. "An arrangement was made to continue cooperation for the purpose of making the Syrian political process more active," the Russian leader said. "The task now is that the constitutional committee in Geneva should be formed and start working," Putin said. 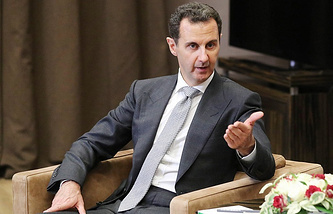 "At the same time, it is important to undertake collective efforts for recovery of the Syrian economy in order to create comfortable conditions for the purpose of refugees’ return," he added. The President of Egypt was informed about steps undertaken by Russia to settle the situation in Syria, the Russian leader said. "We compared notes on this problem and agreed on join work," Putin said. Negotiations held confirmed that Moscow and Cairo have similar or close positions on many international and regional issues, the Russian President said. "Cooperation between our country has always been and remains the effective factor of supporting security in the Middle East and North Africa," Putin noted.